Control appetite with natural blue green algae supplement This natural blue green algae supplement by Healthy Supplements may be beneficial for appetite control. This natural Blue-green algae powder may be beneficial for suppressing the appetite and hunger thus this supplement may be beneficial in dealing with emotional overeating. Our herbal blue green algae may assist in coping with overall caloric intake. Blue green algae boosts energy levels Obtaining numerous nutrients such as carbohydrates, proteins and amino acids, our herbal blue green algae powder may provide the body with an amount of energy. Blue green algae may be useful in boosting physical and mental energy. This supplement my show its benefits in improving the endurance levels and stamina. Blue green algae cleanses the body This herbal powder by Healthy Supplements may be beneficial for body clean the as well as promoting weight loss. By cleansing the body our natural supplement with blue green algae may support digestion. This supplement may be beneficial in dealing with yeast and candida as well as boosting energy levels and helping with weight loss goals. Weight loss with blue green algae supplement One of the numerous health benefits of this herbal blue green algae supplement is weight loss. By balancing gut flora and suppressing the appetite this natural supplement may be useful for burning fat due to its level of nutrients, which are necessary for the body health. By supporting the weight loss this natural supplement may provide the increase of energy as well. Klamath blue green algae 500 - BLUE GREEN ALGAE ORGANIC 500 MG - improve energy (6 Bottles): Our natural supplement with Blue green Algae by Healthy Supplements may be useful for the body health due to its numerous health benefits. This blue green algae powder is a rich source of nutrients and antioxidants may be beneficial for controlling energy levels, promoting digestion and immune system. This supplement may also assist in weight loss. BENEFICIAL FOR IMMUNE FUNCTION: Having numerous health benefits this herbal blue green algae supplementation may show its properties in promoting the immune system function. Acting like antioxidant this algae powder may strengthen immune system. Additionally to its immunity support properties this blue green algae may improve memory, increase energy, support digestion and bowel health. RICH IN NUTRIENTS: The blue green algae supplement by Healthy Supplements may be a natural source of nutrients such as proteins,amino acids and antioxidants. Low calories this herbal algae supplement contains minerals such as calcium,potassium, and zinc including Vitamins Vitamins A,B,C and E. Blue-green algae may be a source of essential amino acids as well. Those numerous vitamins and minerals in blue green algae may be beneficial for dealing with fatigue and promote overall well being. PROMOTE DIGESTIVE HEALTH: Blue-green algae by Healthy Supplements may be useful in the maintaining and promoting digestion. Furthermore, this supplement may show its properties in balancing the flora in the gut, which may assist in digestion and cope with candida and yeast overgrowth. 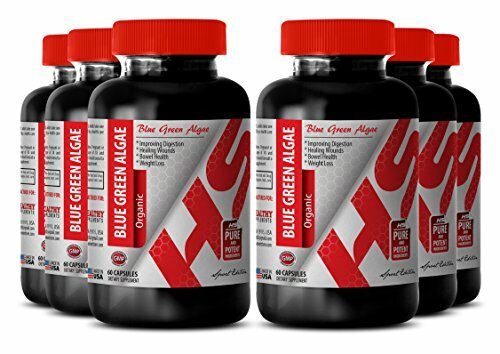 BLUE GREEN ALGAE ORGANIC - Each bottle - 500 MG - all natural Non-GMO, Gluten-Free formula to boost energy and support weight loss, improve mood, control overeating, reduce caloric intake and cleanse the body, boost energy levels and reduce fatigue, improve overall health. Made in USA. Scientifically standartirized to the highest level of our active principles. 30-day 100% money-back guaranteed.